We got up around 7 a.m. this morning and got ready for the day. The weather was supposed to be better today with no prediction for rain. There were still a few clouds around when we got up, but as the day went on most of the clouds disappeared and the sun came out. It was still cool out but at least it wasn’t raining. After breakfast we took a short hike to Lecht Falls, which was just a short ways outside of town. Eric got a few pictures and then we made a loop and came back into town. On our way into town we got a small snack and went back to our room to figure out the plan for the afternoon. 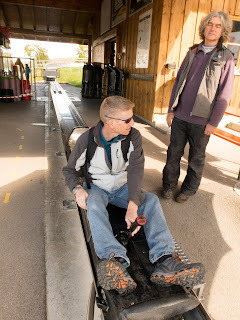 We finally decided we would attempt to take the bus to the Tegelberg lift, but instead of taking the lift to the top of the mountain, we would see if the summer luge ride was open. We caught the bus at the train station. 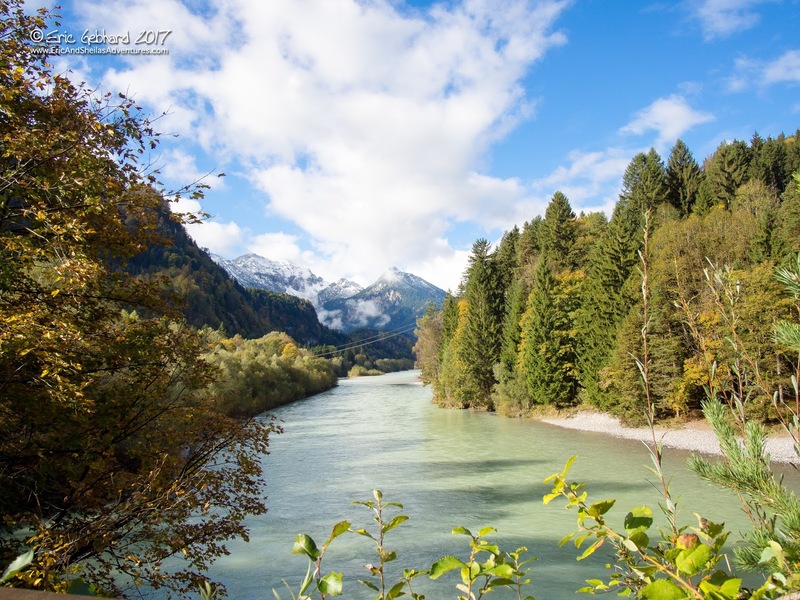 (With the use of the Füssen card provided to us by our bed and breakfast, the buses are free.) We took the bus to the Castle ticket area, which was the end of the line for the bus we had boarded. We could have waited around for a while for another bus to come along that would go all the way to Tegelberg, but we decided to walk instead. We found our way across the parking lot through the throngs of tourists to the road that led to Tegelberg. 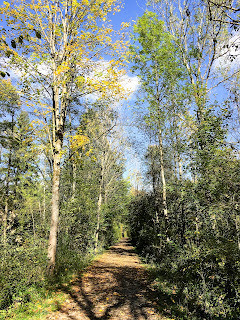 We walked along the road for a ways and then a trail cut off toward the mountain. 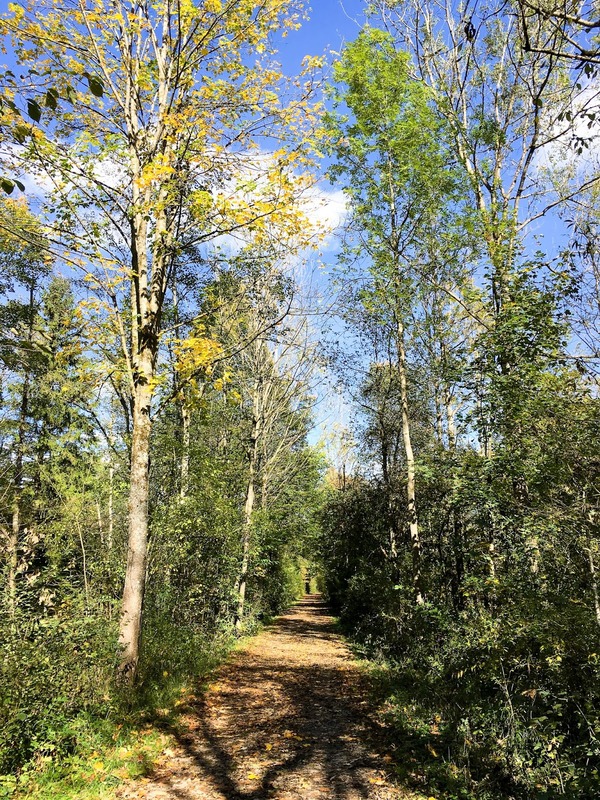 We took the well maintained trail through the lush green pastures and forest and zigzagged our way over to the lift area. When we arrived at the lift area, we were in luck, the summer luge was open. We bought a shared ticket for a total of six rides—so we each got to go down three times. 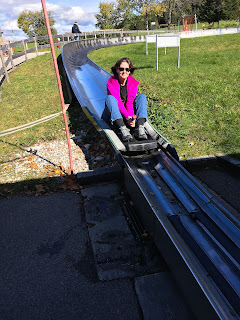 It was really fun and you could go as fast or slow as you wanted. Obviously, each ride got progressively faster as we became more comfortable. Eric’s top speed was approximately 26 mph and mine was about 23 mph. We had our Strava app running the whole time so we could figure out how fast we went. After our fill of bobsledding, we wandered over and waited for the next bus to take us back to Füssen. The buses to the lift obviously don’t run as often as the ones to the castles, but we only had to wait about 20 minutes for the next one. The bus ride back to town didn’t take long, but once we reached the outskirts of town we were just creeping along, so we went ahead and got off. We figured it would be faster to walk. We walked into town and got a gelato and then made our way back our room to have another afternoon nap—after all, we are on vacation! After our nap we decided to go back to the café where we got the spaghetti the day before. The spaghetti was so good, we decided we would do that for dinner again. One order was the perfect size for two people. We ordered our spaghetti and took it back to our room to eat before packed up our stuff so we could get up early the next morning to head toward Munich. We got up around 6 a.m., got cleaned up, and got the remainder of our stuff packed so we could pay the bill for our stay at the bed and breakfast and then make our way to the train station to catch the 8 a.m. train. It was a bit dreary again today with light rain and heavy dark clouds. After we paid our bill and had a quick bite to eat, we grabbed our bags and wheeled them through the deserted cobblestone streets to the train station. 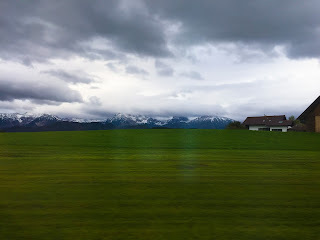 The view from the train platform was beautiful of the snow covered peaks in the background. The day we arrived there was no snow anywhere and viola, the next day there was snow. It was actually very pretty. Our train arrived and we boarded for the 2-hour trip to Munich. I think Eric and I both caught a couple Z’s on the train. There is something about riding on a train that just lulls one to sleep. We arrived in Munich and decided to take a few hours to explore a little. 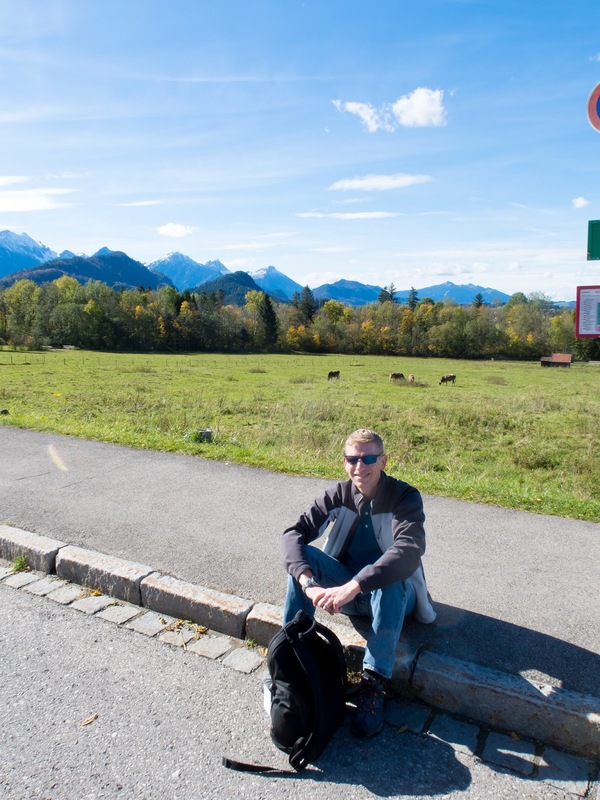 After figuring out how to store our luggage in a locker at the train station, we set off to figure out where the starting point was for Rick Steves’ Munich city walk. 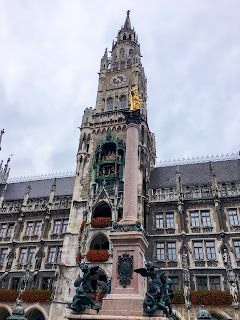 We finally figured out how to buy a ticket on the local subway and headed for Marienplatz (Mary’s square). For a thousand years, The New Town Hall has been the center of Munich. The building was built in the late 1800s and survived the bombs of World War II. Most of the other buildings around it were destroyed and had to be rebuilt after the war. The New Town hall was built in a Neo-Gothic style and is famous for its glockenspiel. 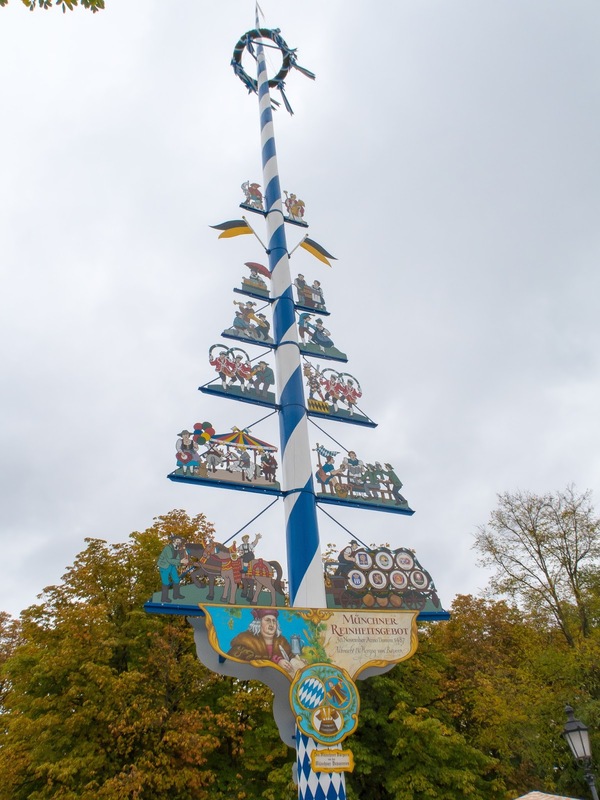 Every day at 11:00 and 12:00, the tower chimes a tune and the colorful life-size figurines dance and spin for about 10 minutes, telling the story of a noble wedding that took place in 1568. After watching the 11:00 glockenspiel show, we sat down at a café table in the square and had a light snack before continuing on with our walking tour. The next stop was St. Peter’s Church. We checked out the outside of the church and then decided to hike the 306 wooden steps to the top of the spire on the very narrow one-lane staircase for two-way traffic. Luckily when we got to the top it wasn’t raining, but it was very crowded because the 12:00 glockenspiel show had just started. 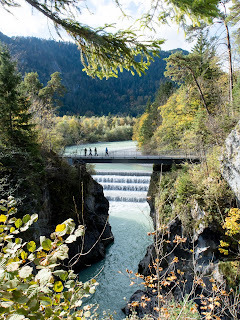 We hung out for a while and took in the sights and snapped a few photos and then headed back down. When we made it back down to the bottom, we decided to step inside the church. Sunday mass was going on, but we stood at the back and enjoyed the ornately decorated interior of the church. The next stop on the walking tour was the Viktualienmarkt (closed on Sunday) with the landmark maypole in the middle. Too bad the market is closed on Sundays, it would have been a neat place to wander around. The market sits on some of the most expensive real estate in town, but locals love it, so the city protects the old-time shops. Apparently, Müchners consider the produce here to be top quality. Then we walked past the Ohel Jakob Synagogue and made our way to the Asam Church. This is a tiny church (30 feet wide) built by the Asam brothers in 1740 and wedged between two houses. The Asam brothers were architects and originally built the chapel as kind of a showcase church to display what they could build for those looking to have a church designed and built. It was quite something to see. We then made our way back down the Kaufingerstrasse. For the 1972 Olympics the street was turned into one of Europe’s first pedestrian only zones. 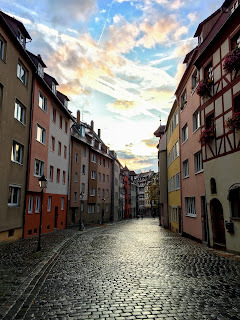 We followed the street for a while and this led us back to Marienplatz. As we were running short on time and wanted to get back to the train station to catch our train to Nuremberg we decided to cut the city walk short. 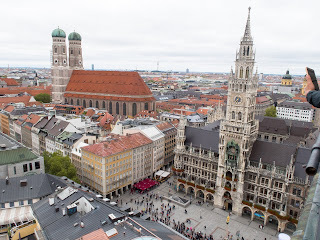 There is obviously a lot, lot more to see in Munich, but we just didn’t have that much time. 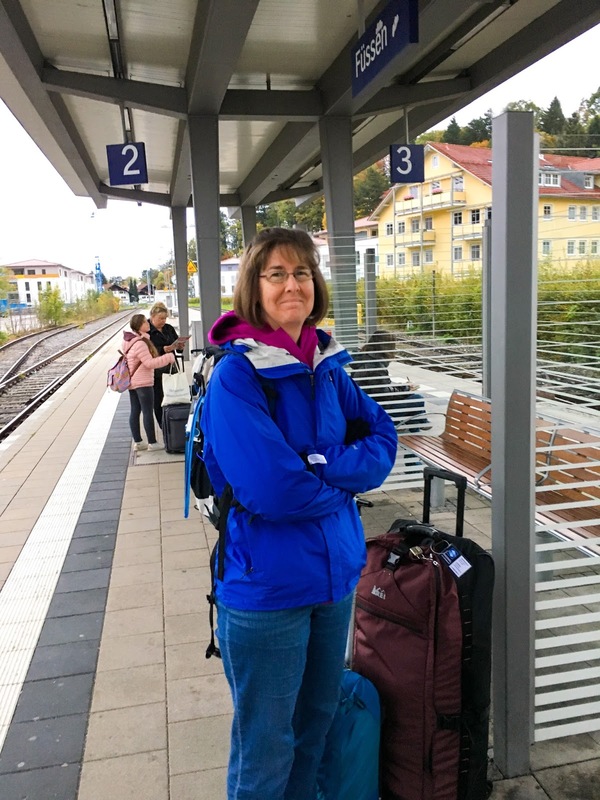 We got on the subway and made our way back to the train station to collect our bags and get on the high-speed train to Nuremberg. We had not reserved a seat on this train, but managed to find a couple unreserved seats. By the time the train left, though, first-class was packed. It was only an hour and 10-minute train ride from Munich to Nuremberg. I enjoyed watching the speed posted on the overhead sign board. We actually got up to 300 km/hr. That is obviously the fastest I have traveled in anything on land. The trains are so smooth and quiet, you don’t even feel like you are going that fast. We made it to Nuremberg and then had to figure out how to get from the main train station to our VRBO apartment we had rented within the old walled city. We finally got our bearings and took the subway and then the tram to the stop just outside the old city wall where our apartment was located. Eric then had to haul our 50+ plus bag up four flights of stairs (it is an old building with no elevator—which I knew when I rented the apartment). The owner greeted us at the door and handed over the keys and oriented us to the apartment. The owner actually lives in the apartment one floor below. It is an amazing apartment with two bedrooms, one with a king size bed and one with two twin beds, a large living and dining room, a kitchen, and a bathroom. As it is on the top floor of the building, we have amazing views from three sides. We look out one side just over the top of the adjacent old city wall—pretty cool. As we were quite hungry when we arrived, we decided to go out exploring to see if we could find food. Most shops and a lot of the restaurants are closed on Sunday, so there weren’t a lot of options. We managed to find a small place where we could get some fries and I had a roll with sauerkraut. They are very big on meat such as sausages and brautwurst here, so sometimes it can be tough to find something vegetarian. We sat in the small café and ate our food. Several other customers came in after us, one of which was an American grad student from Michigan who was also here for the European Microwave week. He was apparently here as a speaker at the show. He sat with us at our table and we had a nice chat with him. After we finished eating, we decided to wander around the old city for a bit since it wasn’t terribly rainy (yet) and was still daylight. It looks like there will be a lot of shops and streets for me to explore. As the sun was finally starting to set, we made our way back to our apartment to settle in for the week.